Offers a large selection of unusual weaving yarns from Japan. Includes a gallery of handwovens. USA. Weaving studio and showroom for Japanese hand woven textile fabrics and ribbons, from a wide variety of fibers. Extensive technical information. On-line purchasing facility. If the business hours of Habu Textiles in may vary on holidays like Valentine’s Day, Washington’s Birthday, St. Patrick’s Day, Easter, Easter eve and Mother’s day. We display standard opening hours and price ranges in our profile site. 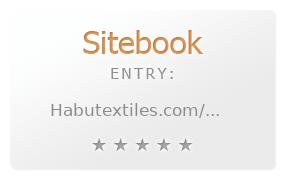 We recommend to check out habutextiles.com/ for further information. You can also search for Alternatives for habutextiles.com/ on our Review Site Sitebook.org All trademarks are the property of their respective owners. If we should delete this entry, please send us a short E-Mail.